Double adjustable design with right and left hand threads. Lightweight, strong 1 1/2 billet aluminum center sections with color Hotchkis logo. Hotchkis exclusive, high articulation, easy to lubricate, Swivel-Max bushing. 100% TIG welded, heavy duty steel construction. Durable black powder coat finish. Easy in-car pinion angle adjustments for improved traction and reduced wheel hop. Heavy duty construction for long lasting durability on the street or track. Swivel-Max bushings allow for suspension articulation without unwanted longitudinal flex. Complete, ready to bolt-in and includes polyurethane rear end housing bushings. 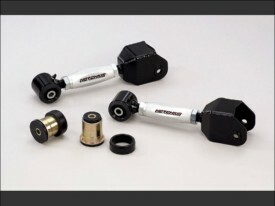 Improve the traction and handling of GM Muscle Cars with the Hotchkis Double Adjustable Upper Trailing Arms. These exceptionally durable arms allow for easy pinion angle adjustment for reduced vibration and increased traction. The exclusive Swivel-Max bushings offer non-binding articulation during suspension travel, which improves traction and rear suspension efficiency. Finished in gloss black powder coat and clear anodizing, these Double Adjustable Trailing Arms look great and perform well.